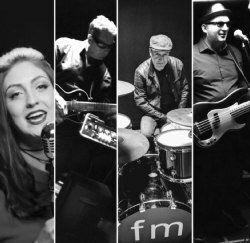 The FM Band are a four piece group that has invested heavily into the latest technology in order to produce the best quality live sound (with no backing tracks). This amazing high quality, high fidelity sound provides the backing music for our wonderful vocalist Faye, who has been singing her heart out since the age of seven. Her incredible voice and the extremely talented musicians who support her, help make the FM band stand out from the crowd. The FM Band love playing live music and they love to entertain a crowd. Faye makes a real connection with the audience, and soon gets them in the party spirit so that everyone has a great time and dances their socks off! It is this connection with the audience that fuels the band s passion to play music that can transform any occasion into a memorable one. So be it a wedding, a birthday party, anniversary or any other special event, The FM Band will provide a quality performance that will make it a night to remember! The FM Band is based in south east England and can accommodate a range of venues, providing there is good access and plenty of time to set up and sound check. As a four piece they can reproduce many of the sounds associated with larger bands through triggering technology, which is played live and not as pre-recorded backing tracks. They also have their own PA system and lighting rig. The FM Band is also part of a wider network of musicians to call upon, so a brass section or backing singers can easily be added to the core four piece band to provide a bigger spectacle. Larger PA systems and lighting rigs can also be added for larger venues, it all depends on just how far you want to push the boat out. So please have a browse around the website to see what we look and sound like, and if you would like to enquire about booking the band for your night to remember, then please email us at info@thefmband.co.uk and we will soon get back to discuss your requirements.